New hotel in Las Vegas, New Mexico off I-25, Highland University, Historic Old Town, Montezuma Castle. 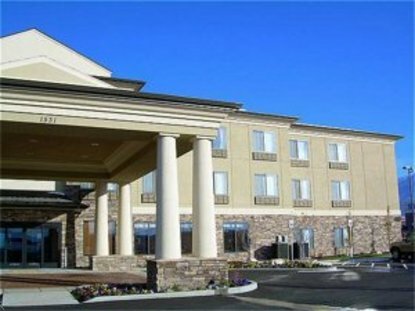 Brand new Holiday Inn Express Hotel and Suites convenient access to I-25. Beautiful setting filled with majestic mountains and wide open plains. Minutes away from historic Old Town Las Vegas, Highlands University and Montezuma Castle. Large rooms w/free Internet, luxurious new bedding, granite counter tops, suites equipped w/ a wet bar, microwave and refrigerator. Indoor pool, business center, Guest laundry, large meeting space can comfortably accommodate up to 85 people. This hotel is committed to providing accessible facilities under the American Disabilities Act. If your accessibility needs are not met, please contact the Hotel Manager on Duty. Should you require additional information regarding accessible facilities for guests with disabilities, please call 1-800-Holiday (U.S. and Canada) or contact the hotel directly. For the hearing impaired, TDD service is available at 1-800-238-5544 within the U.S. and Canada.